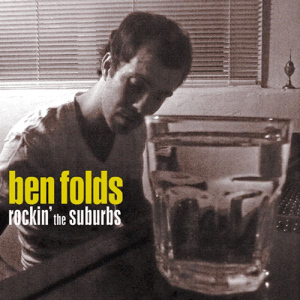 Folds’ 2001 album “Rockin’ the Suburbs” was his first solo album since the dissolution of Ben Folds Five. It marked a progression for him to a more guitar-based sound, and despite its inauspicious release date, it remains one of his best selling albums. The title track was released as the first single from the album, and became his best selling song to date. Just to clear up any confusion: the song “Rockin’ the Suburbs” mentions the release of a new cd, and in the clip, Folds brandishes a copy of his new album, also titled “Rockin’ the Suburbs”, which features the song of the same name. It’s all very recursive, and you’ll probably just get a headache if you think about it too much. Tagged 2001, Ben Folds, Rockin' the Suburbs, Sep 11.